Surprise! I stashed away a couple of these now-impossible-to-find gift sets before they disappeared from Sam’s Club (where they were exclusively carried and sold out all over the country within a matter of weeks). 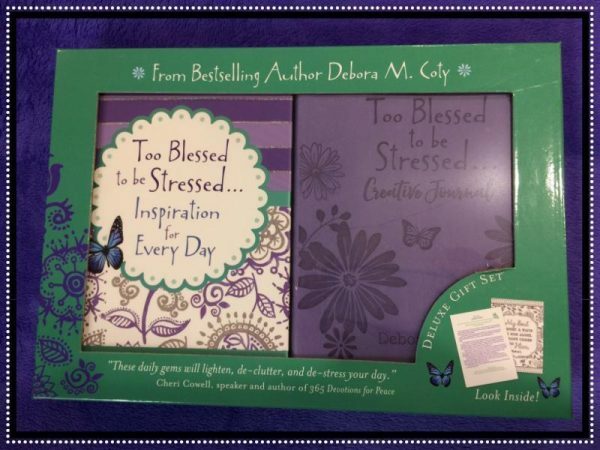 This lovely and unique Too Blessed to be Stressed gift set features my 365-day Inspiration for Every Day devotional plus a one-of-a-kind Creative Journal especially fashioned to augment the daily devo readings with decom-stressing coloring images, applicable scripture, reflective questions and lots of journaling space. All you have to do to get your name in the fedora is SEND ME a photo or description of your favorite blessing of winter (I’m hoping for some lovely snow shots or cozy family popcorn nights to share with our other BFFs on my blog). You know, something to make us say awwwww and feel all warm and toasty inside. One random name will be drawn on February 1 and the winner will be announced on my blog. I hope it’s you! P. S. Be sure to subscribe to my BLOG now [click HERE and scroll down just beneath my photo] so you don’t miss a thing!